Amplify Hair Volume 60 Pack - This has been carefully developed by our expert team of formulation scientists in conjunction with nutritionists and hair care professionals, using years of collective knowledge and experience. The result of which is a comprehensive and distinct multivitamin purposely chosen to benefit hair health. 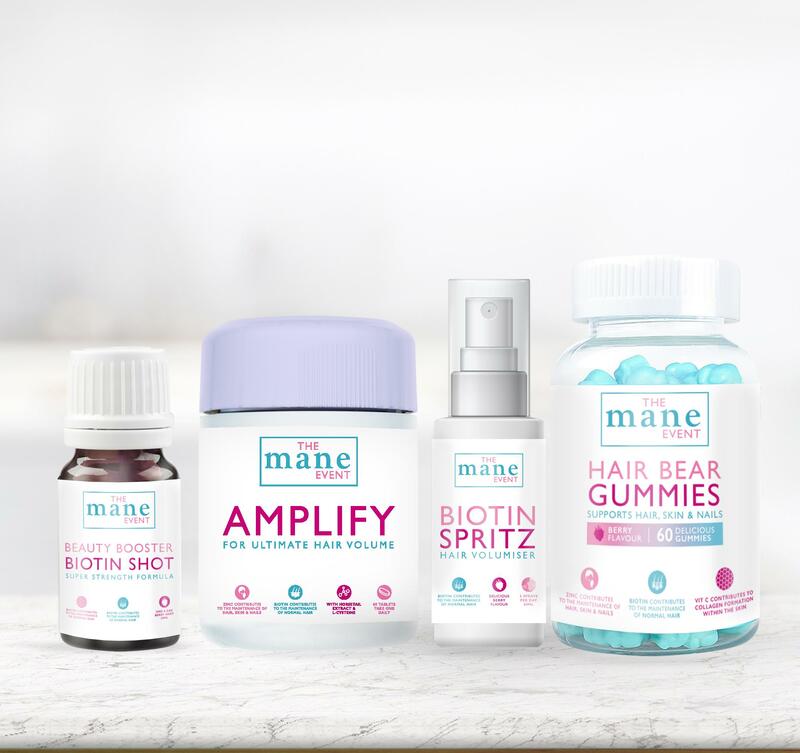 Biotin Shot x 1 - Supercharge your Beauty regime with The Mane Event Beauty Booster, our highest strength Biotin supplement. Through its active Biotin content, the Beauty Booster liquid supports both skin & hair for ultimate radiance. With 10,000µg of Biotin per daily serving The Mane Event Beauty Booster is twice the strength of other supplements. Biotin Spritz x 1 - 70 Days Supply - Pump up the volume with The Mane Event Biotin Hair Volume Spritz. Just 5x sprays per day delivers 5000µg of Biotin (10,000 % NRV) with a delicious red berry flavour. With high strength levels of Biotin, The Mane Event Biotin Spritz helps to support hair volume & complete beauty radiance. Hair Gummies 60 Pack - Perfect for all types, textures & colours of hair; promote longer, stronger & shinier locks for better hair days. Supplementing your beauty regime with two gummies a day supports healthy hair growth & thickness, the maintenance of colour & scalp condition all of which is important to get that lustrous shine. Adults and Children over 12 years: Please see individual pack. Amplify - Calcium Carbonate, Horsetail (Equisetum arvense L.) Extract, Microcrystalline Cellulose, Green Tea (Camellia sinensis) Extract**, DL-Alpha-Tocopheryl Acetate, Ascorbic Acid, Maltodextrin, Calcium Pantothenate, Modified Maize Starch, Acacia Gum, Ferrous Fumarate, Hydroxy Propyl Methyl Cellulose, Nicotinamide, Zinc Oxide, L-Cysteine Hydrochloride Monohydrate, Magnesium Stearate, Anti-Caking Agent (Silicon Dioxide), Colours (Titanium Dioxide, Iron Oxides), Talc, Riboflavin, Copper Sulphate Pentahydrate, Humectant (Glycerol), Sucrose, Maize Starch, Silicon Dioxide, Retinyl Acetate, Potassium Iodide, Folic Acid, Sodium Selenite, DL-Alpha-Tocopherol, Biotin, Cholecalciferol. Hair Gummies - Malt Syrup, Sugar, Glucose, Pectin, Titanium Dioxide E171, Citric Acid, Sodium Citrate, Natural Flavours, Vegetable Oil (contains Carnauba Wax), Brilliant Blue E133. Biotin Spray - Water, Glycerine, Flavouring, D biotin, Citric acid, Potassium sorbate, Tri sodium citrate, Xanthan gum, Sucralose. 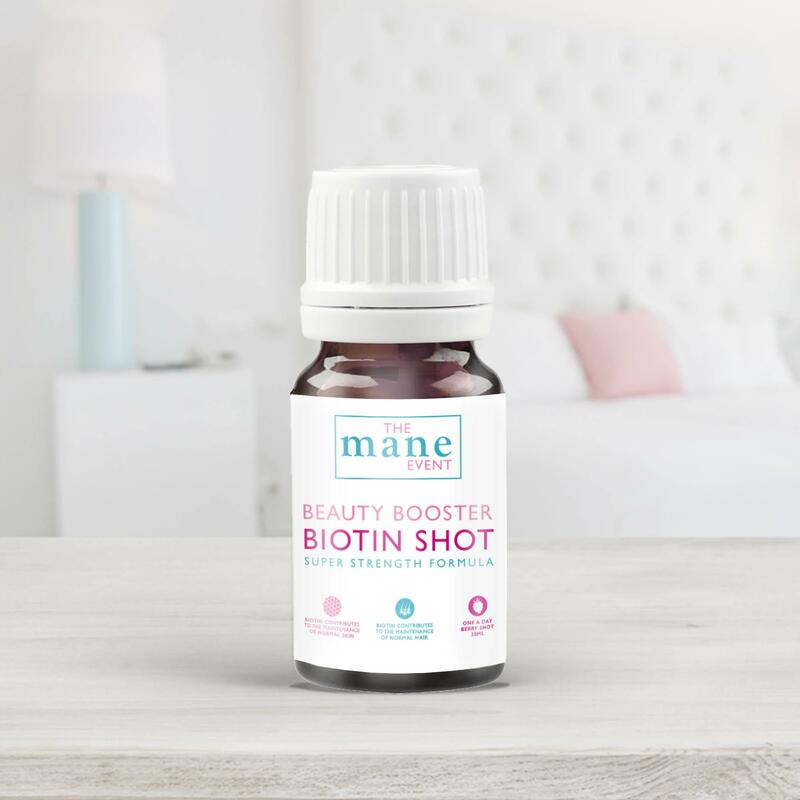 Biotin Shot - Water, Blackcurrant juice, Flavouring, Citric acid, Potassium sorbate, Tri sodium citrate, Xanthan gum, Sodium benzoate, Sucralose, D biotin, Calcium D pantothenate. "If pregnant or breast-feeding, taking medication or have any medical condition, ask a health professional before use. Do not use if safety seal under cap is torn or missing. Keep out of reach of children. "